The makeup of experimental jazz trio Maybe Monday might seem counter-intuitive, but that makes the music all the more satisfying in its realization. 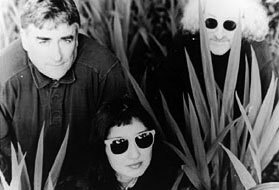 Featuring guitarist/multi-instrumentalist Fred Frith, koto artist Miya Masaoka, and sopranino/tenor sax player Larry Ochs, the adventuresome group weaves a mesh where electric and acoustic, ethnic and urban, tradition and experiment coexist within delicate, ingenious, completely improvised music. Fred, a fixture for more than 25 years in the zone where rock music and new music meet, has founded groups like Massacre, Skeleton Crew, and his own critically acclaimed Guitar Quartet, and has worked with folks like John Zorn, The Residents, and Brian Eno. Miya works in the musical worlds of jazz, Western classical music, electronic music, traditional Japanese music, and free improvisation, and has performed extensively, both solo and with a wide variety of musicians and traditions, from Pharoah Sanders to the Berlin Opera. Larry has released dozens of CDs and toured as a member of numerous bands including Rova Saxophone Quartet, as well as collaborating with folks like Anthony Braxton and John Zorn. Maybe Monday has been memorably described by one reviewer thus: "Contradictions abound - in the ferocious lyricism of Ochs, the placid aggression of Masaoka, Frith's passionate detachment - but the result, rather than shocking or unsettling the listener, is as familiar as breathing, as inevitable as fire."